The boys and I love a good fantasy or science fiction novel. There is just something wonderful about escaping from the ordinary into something extraordinary. A story about a teenaged boy who learns his father’s true identity seemed like a great fit for us. 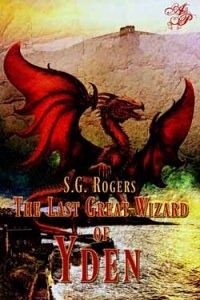 Hence, I had no hesitation requesting the chance to review The Last Great Wizard of Yden by S. G. Rogers. While the boys have not read it yet, I suspect they will all love the story as much as I do. Wizards, dragons, bad guys and the ability of wizards to transport between the far away world of Yden and Earth combine for some great appeal. The characters and plot were able to engage you in the other world of Yden, although I must admit that the story conclusion seemed to go quicker than I might have expected. Then again, that just might be my brain screaming that there is far more that can be told about this magical place from the imagination of S.G. Rogers. After his father is kidnapped, sixteen-year-old Jon stumbles across a closely guarded family secret–one that will challenge everything he has ever believed about his father and himself. A magical ring his father leaves behind unlocks a portal to another dimension, but in using it, Jon unwittingly unchains the forces of evil. A crisis develops when a malevolent wizard transports to Earth to kidnap one of Jon’s friends. With the help of some unlikely schoolmates, and a warrior princess from Yden, Jon embarks on a dangerous quest to free his friend and his father from the most vicious wizard the magical world has ever known. In the end, Jon will be forced to fight for his life as he attempts to rescue the last great wizard of Yden. You can read an except of the book on the author’s blog. The Last Great Wizard of Yden is available in ebook format for $2.99 via Astraea Press, Amazon ($0.99 for Kindle at the moment), and Barnes and Noble. It would definitely make a nice addition to your eReader for any young adults in your house that enjoy stories with inclusion of magic. Disclaimer ~ We were sent The Last Great Wizard of Yden in ePUB format to facilitate this review. No monetary compensation occurred and all opinions are my own. Thanks so much for taking the time to read my novel...and I'm happy to tell you there are two sequels already written, awaiting publication later this year. Thanks again.